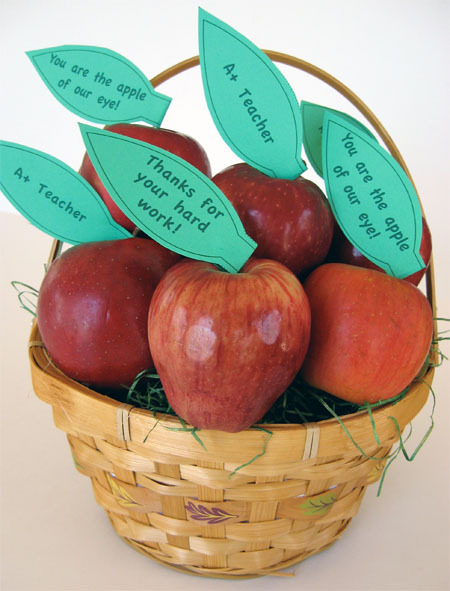 Placing large baskets of apples in the teacher’s lounge during Teacher Appreciation Week (May 4 – 9, 2009) is a nice healthy treat. To make them extra special attach leaves with special notes. 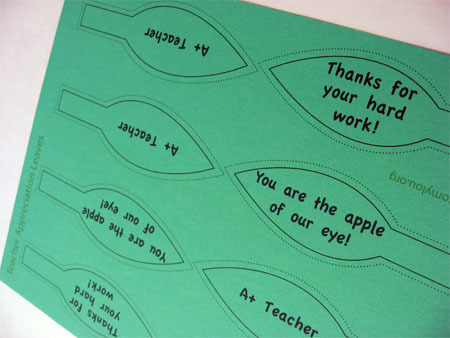 Download and print out the teacher appreciation leaves onto green cardstock. Cut out and hot glue leaves to toothpicks or the stem of the apples. The apples won’t last as long if they are pierced with a toothpick, so when possbible glue to the stem of the apple. 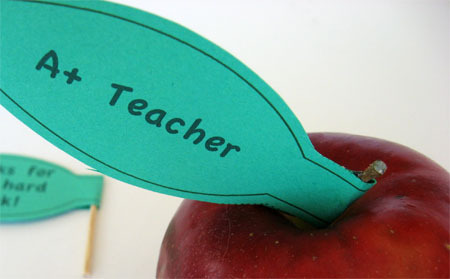 Don’t forget to check out these Teacher Appreciation Ideas! Hi there, thank you so much for the adorable subway art! I adore this idea!! I would love to use this idea for a traveling theme for our class. Would it be possible to have a template of the leaves that I can reword to fit our theme? Just thought I would ask. Great idea and so simple! Thanks for the idea and printable leaves-so cute. We're doing a fruit tray for our teachers tomorrow and a bowl of apples with these leaves will be right in the center. I think it'll look neat! I am loving these apples! This is so cute!! I will use them this week and ad to my free download page:-) Fun! This is uber-cute! Something so simple, yet it makes all the difference in the world! It just amazes me how creative some folks are! Thanks for sharing!!!! This idea is the apple of my eye! Bravo! I'm *so* doing this for Rebecca's teacher. Love it! Too cute! I'm sure the teachers would love this! I LOVE this! I always give my children's teachers a basket of apples on the first day of school, but the leaf on the apple is sooooo cute!!! Fun! This brought back such memories of when I was a teacher! I did the same thing for each of my students on their birthdays, except I wrote their names and "happy birthday" on the paper leaf. I think they liked getting apples on their special day, even though they were 18 (I taught high school Physics) - they carried their apples around to show them off, silly things! There was a spell when good, large apples were just impossible to get at our local fruit stand so I gave out pears, and the students were politely appreciative but it was just not the same. Thanks for this fun walk memory lane for me! Cute! 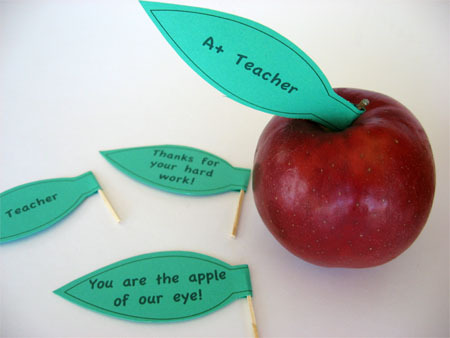 ♥ all the teacher appreciation ideas! LOVE this! You're so creative! I'll be linking. i like it!!! cute and simple and fun! That is too cute. I teach 2nd grade and doing something like that would just touch my heart!